It's been cold here of late. 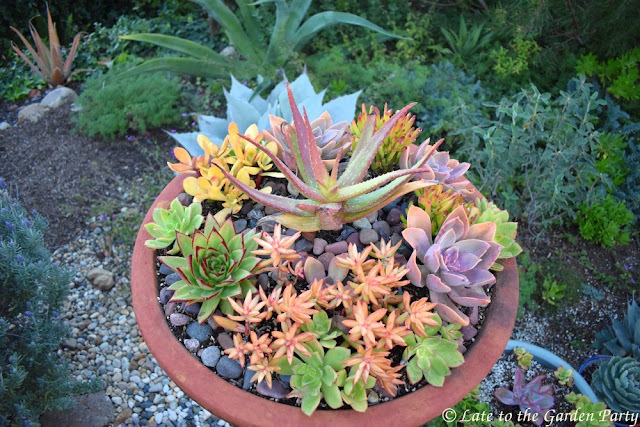 No, not cold by the standards of those of you awaking to frost decorating your plants or snow blanketing everything in sight, but cold compared to what we're used to here in my area of coastal Southern California. The color I seek from my garden is largely lacking now too but, buoyed by recent rain, my succulents offer a bright note. We got a little light rain last night and expect more this afternoon and tomorrow and, while every rainstorm brings vague hopes of a flower-filled future, I remain mindful that we're still deeply entrenched in drought and likely to remain so as our world's climate leans toward increasing extremes. In that vein, I've been steadily increasing my reliance on succulents in my garden. After meeting a friend for lunch yesterday, I took the opportunity to stop in at a nearby nursery specializing in succulents. Officially, my objective was to find a few Christmas gifts on my list but you will note that I'm not selfless enough to ignore plants that scream "buy me!" 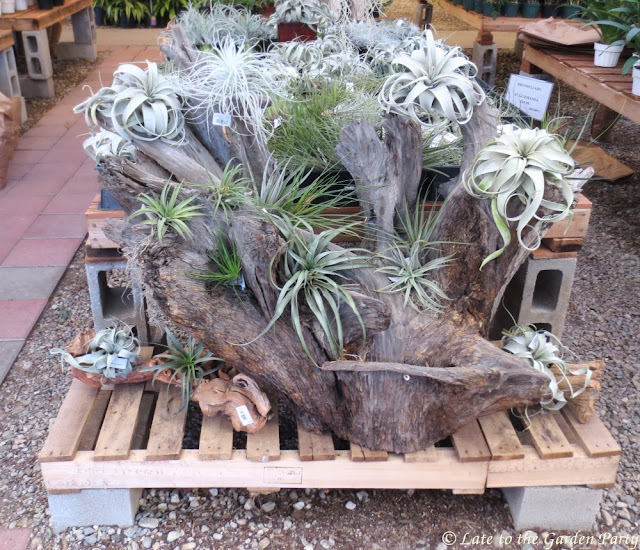 I've been thinking of creating a feature to hold succulents and bromeliads in one area of my garden so I was immediately drawn to the impressive pieces of driftwood lined up near the parking area. Can't you just see succulents, airplants and other bromeliads tucked into those crevices? Then I checked the price tags and my dream of using something like this in my garden rapidly evaporated - or, more accurately, exploded. The $720 price tags on these pieces obliterated my half-formed plans. However, I did find 2 of the 3 items I had on my Christmas gift list. And, yes, I did purchase a few things for my own garden too. Holiday gift shopping can get expensive! Yeah, the prices on those stumps are--wow. Part of the price might be to get one of those beasts out of the ground without taking it apart first. Not easy! A hundred bucks and they would have me , but you can buy lots of plants and lots of containers for 720 ! I wonder where the driftwood was collected ? We've had really nice rain events thus far-we've had almost 5 inches ! As an aside, I have tried to find businesses that install rain catchment systems in my area. There seems to be no such thing-it's a complete dyi gig which is beyond my skill set. Looks like I'm going to have to settle for a rain barrel. I would've considered $100 a great deal, Kathy, but $720 was beyond the pale. My husband guessed the wood came from Oregon. I don't know what that assumption was based on but I've noticed that a local garden center with much smaller pieces also markets it as having coming from Oregon. When I was looking into rain catchment systems a few years ago, I remember finding one firm that handled system design and installation of an underground storage systems that wasn't feasible for us. Texas seems to be well ahead of California there. My biggest tank is a Bushman Slimline (265 gallon capacity). My husband handled installation. The seller didn't offer any installation services. I'm figuring there's a driftwood kingpin up there somewhere, Loree! Maybe when you finally make that long-talked-about trip to the PNW you could drive up, and bring some driftwood home. Despite what Loree said, our beaches are famous for their great driftwood. I have a medium size piece that I bought at the NWFGS a few years ago planning to hang Bromeliads on, but never got around to it. I had my husband half-talked into taking a train trip up that way in advance of the NWFGS (or whatever it's called now) but at present it looks as though we're going to be embroiled in a lengthy kitchen remodel starting early next year. So I (like many others) am setting my sights on 2020! That Violet Queen is a colour I covet. Unusual, and appealing not plain weird. It is a particularly pretty succulent, Diana. I'm trying to get better about massing my succulents to improve their impact in the landscape, hence my purchase of 5 of these. Some entrepreneurial PNW native must have gleaned the beaches of driftwood, rented a large truck and made a haul. At those prices, it'd be worth it! Your renovated planters are looking great! I bet there's a business in discounted driftwood too, Eliza! I hope someone in the PNW is paying attention. When you come up (to visit your husband's relatives, of course) it might be a good idea to fly here and take a uhaul home. 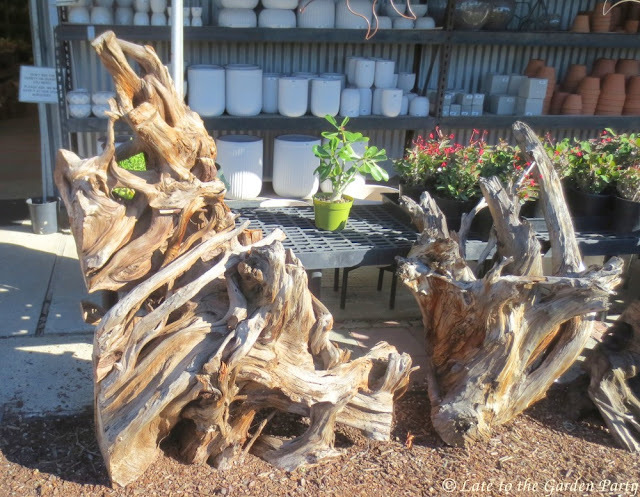 Those driftwood pieces would look great in your garden! Your succulents are gorgeous. Yes, cold is all about what one is accustomed to. A u-haul would be so much less expensive than shipping all those plants, not to speak of the driftwood, wouldn't it?! 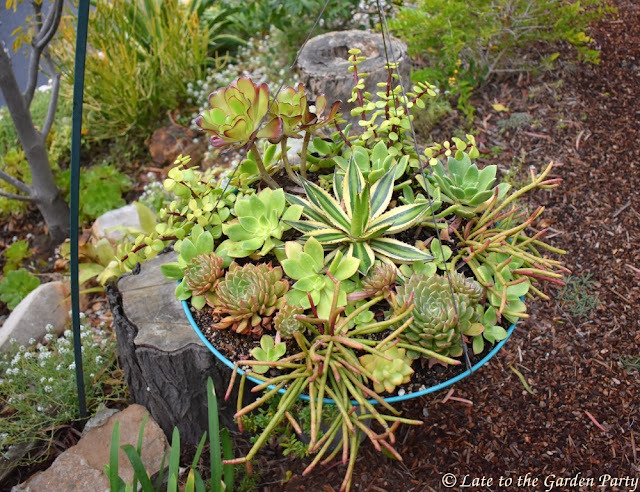 Your succulents are obviously enjoying the rain. Everything looks so plump and healthy. Driftwood prices are outrageous but wouldn't it be nice to have one in the garden. 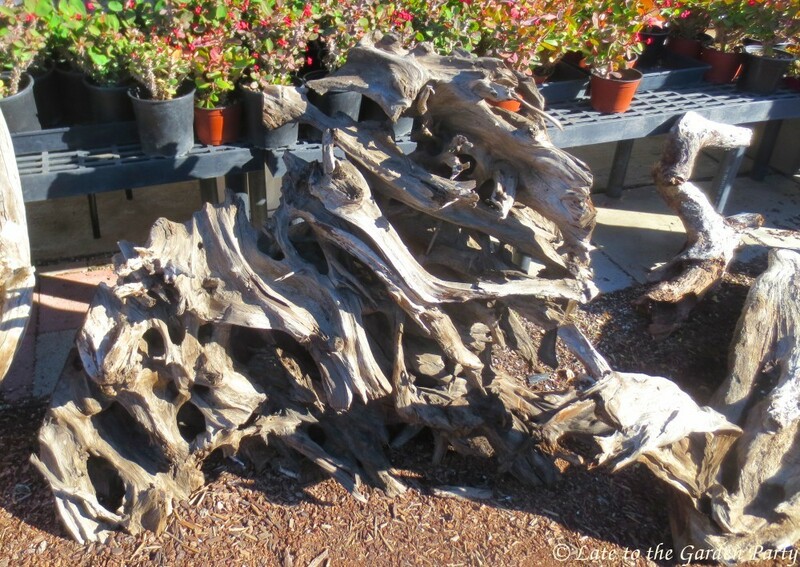 I can be a little crazy when it comes to what I spend on my garden but even I can't stretch my aspirations to encompass a $720 piece of driftwood, Lisa. I've got tree trimmers scheduled to do some major work in just over a week - maybe there'll be some branches from my own garden I can use! I'm totally nuts about succulents now, I can't believe there was a time I didn't like them. How wonderful it must be to be able to have them outside in the garden all year round, even if you can't have a massive bit of driftwood to display them on. Ha! 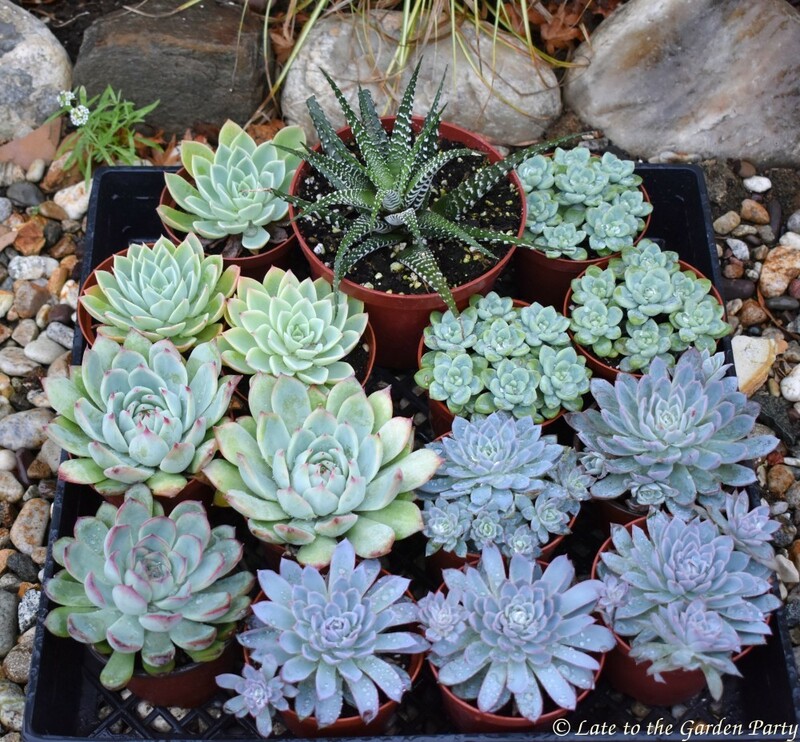 I think I warned you that succulents can be addictive. I wasn't overly fond of them years ago either. Funny, I just read Hoover Boo on using tree stumps for plantings, and now I see it here as well. Is this the start of a meme? No, HB and I just live and shop in the same area and had had a similar reaction to the prices on driftwood. (Her comment on my post is the first one above.) She's more enterprising in sourcing alternative materials than I am, however. In a Vase on Monday: Welcoming the new year! In a Vase on Monday: Merry Christmas!